EghtesadOnline: Exports of Iran’s industrial sector, excluding crude oil, hit 26.74 million tons worth $17.91 billion during the first three months of the current Iranian year (March 21-June 21). This registers a 7.2% decline in value compared with last year’s corresponding period, Tehran Chamber of Commerce, Industries, Mines and Agriculture’s website reported. As for exports, the industrial sector exported 19.63 million tons of goods worth $9.68 billion during the three-month period, up 21.7% in value year-on-year. It had an 83% share in Iran’s total non-oil exports during the period. The sector’s major export commodities were in the categories of chemical materials and products, coke, byproducts of refining oil and nuclear fuels, basic metal production, foods and beverages, and non-metal minerals. In fact, these commodities had a 87% share in the sector’s overall exports, according to Financial Tribune. The average price of exports from this sector stood at $493 per ton, which is up by 11% YOY. The sector’s imports saw a 27.4% decline in value YOY to stand at 7.11 million tons worth $8.22 billion. The industrial sector had a 73% share in Iran’s total imports during the period under review. The sector mainly imported machinery, vehicles, trailers, chemical products, basic metals and communications devices with a combined share of 69% share in the sector’s total imports. The average price of imports stood at around $1,156 per ton, down by 16% YOY. 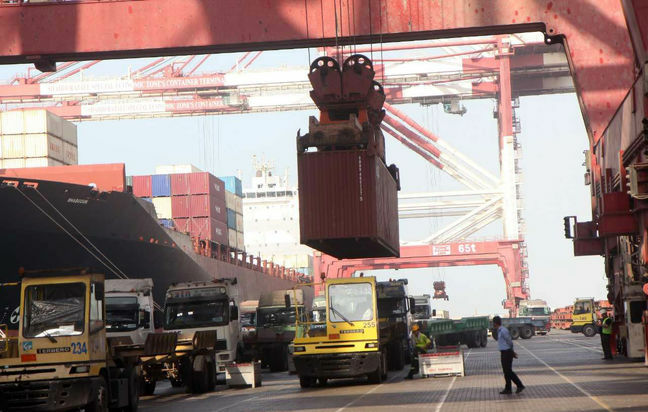 According to the Islamic Republic of Iran Customs Administration, Iran’s foreign non-oil trade stood at 36.3 million tons worth $22.87 billion in the first quarter of the fiscal year, registering a 5.8% rise YOY. Exports hit 27.88 million tons worth $11.61 billion, indicating a 15.58% increase in value, as imports amounted to 8.37 million tons worth $11.25 billion, down 2.76% in value year-on-year. IRICA categorizes non-oil exports into three groups of petrochemicals, gas condensates and “others”. A total of 6.5 million tons of petrochemicals worth $3.5 billion were exported in the first quarter to register a rise of less than 1% in value compared with the same quarter of last year. Petrochemical products accounted for more than 30% of Iran’s overall non-oil exports in Q1. Exports of gas condensates stood at $1.55 billion or 13% of total exports, posting more than a 2.5% decline YOY. Other main exports categorized in this group included liquefied propane ($534 million accounting for more than 4.5% of total exports), light oils except gasoline ($409 million or more than 3.5% of total exports), polyethylene ($306 million or 3% of total exports) and liquefied petroleum gases ($304 million). Exports of products classified within the so-called “others” group fell in the neighborhood of 18.38 million tons worth $6.55 billion accounting for more than 56% of total non-oil exports. Imports mainly included auto parts ($541 million accounting for about 5% of total imports), field corn ($436 million or about 4% of total imports), rice ($375 million or more than 3% of imports), soybeans ($373 million or more than 3% of imports) and mobile phones ($192 million or close to 2% of total imports).